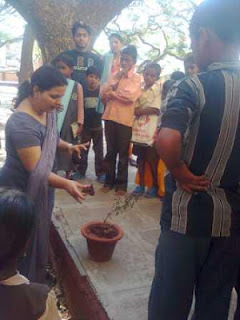 iVolunteer conducted Environmental Education Programme for Door Step School children, on 30th June 2012. 5 Volunteers from this group planned and executed this event for 36 children. 3 teachers, 5 supervisors, and 2 coordinators from Door Step School assisted the volunteers. 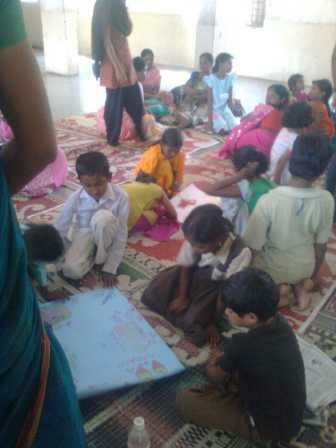 Children from 2 groups were instructed to draw environment-related pictures. Children themselves spoke about the pictures and explained what message they wanted to give. Children from 2 groups were asked to cut pictures from newspapers and make collage regarding environment. Children were then asked to talk about the message given through collage. Volunteers explained the procedure to sow plants in pots. Thoughtful use of electricity and fuels. Why we should stop cutting trees. Maximum usage of non-conventional energy sources. We should stop water wastage by closing the running taps. We should use electric appliances only when required. Maximum utilization of paper, before throwing it as garbage. How to save fuel by cooking food in covered pots. Why we should not use plastic bags. Children participated in all activities with great enthusiasm. Their response to discussions and their environment-friendly ideas were worth appreciating. 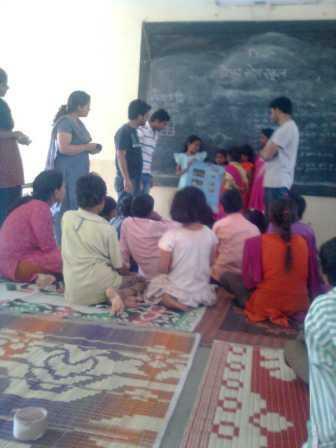 Thanks to iVolunteer group for organizing such an interesting programme at Door Step School!